On June 4th 2016 at 6pm, a portrait of General James M. Gavin has been unveiled at the Airborne Museum in Sainte Mere Eglise. The former commander of the 82nd AB : General Nicholson and the actual commander : General Clarke assisted the ceremony. On June 6th 1944, Brigadier General Gavin, the youngest general of the American Army, jumped onto Normandy. He led the division in the fighting around Sainte-Mère-Eglise and helped lead the battle to open access for Allied soldiers on Utah Beach. In summer 1944, he was appointed commander in chief of the 82nd AB. The portrait depicts General Gavin as he was in 1944, at age 37. He stands in front of the bridge and causeway at La Fiere, just outside Sainte Mere Eglise. A battle raged for several days to seize the causeway to allow Allied troops to leave Utah Beach. 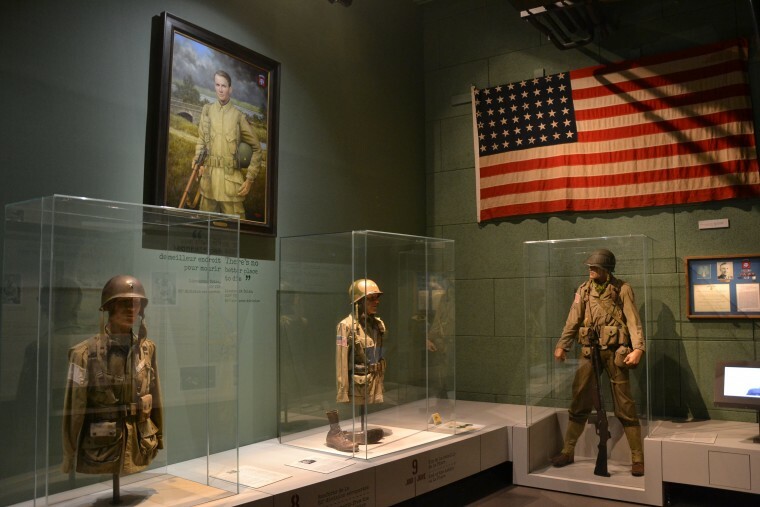 Military historians have described the battle at La Fiere as the most intense action fought by the 82nd Airborne Division during World War II. 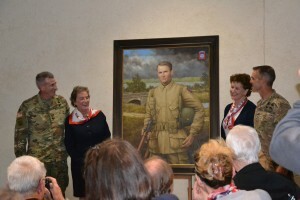 Two of General Gavin’s daughters, Chloe Gavin and Liné Lewis, commissioned the portrait by James Crowley. Mr. Crowley is a noted American portrait artist, and his works are owned by many universities and corporations. The portrait has joined the bust of the General inside the building “Operation Neptune”.